Pay workers outsatanding salaries before Christmas | Buhari tells state governors – Royal Times of Nigeria. 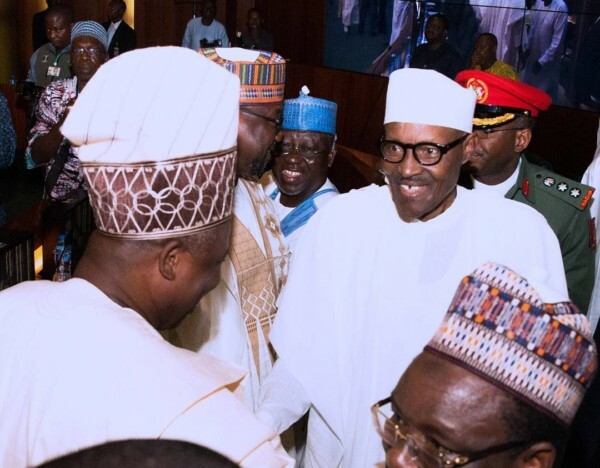 President Buhari on Monday had a meeting with the 36 state governors and he directed them to pay up salary arrears to their workers before the Christmas holiday to enable them celebrate Christmas happily. To ensure that this is actualized, President Buhari also asked the Minister of Finance, Kemi Adeosun, her counterpart at the Ministry of Budget and National planning, Udoma Udo Udoma and the Central Bank governor, Godwin Emefiele, to commence negotiations with the Governors Forum to enable payment of outstanding Paris & London Club refunds, before the end of the year. Imo state governor, Rochas Okorocha confirmed this to state house correspondents after a meeting with the president in Abuja on Monday. He said the meeting was mostly centered on issues of workers in the country. Okorocha stated that President Buhari ordered that workers and pensioners should be paid their outstanding salaries and allowances from the balance of the outstanding Paris Club refund which would soon be paid to them. He said, “It was a brief meeting between the governors of Nigeria and the President of the Federal Republic of Nigeria,”. “The discussion centred on basically the end of year and president himself has expressed the need to make sure that every Nigerian, especially the workers have a beautiful Christmas. “The issue of outstanding Paris Club was discussed and that was taken care of to make sure that workers in various states, everywhere in the country get to celebrate the Christmas. “We also use the opportunity to review our working relationship with the president and we found out that we are in harmony; there is no difference between us and the president, everybody seems to be very happy; we are working together. “We are looking at getting the balance of Paris Club refund thrashed out once and for all,”.